Best known for his work alongside Bo Wiget on the Rune Grammoon label, Swiss guitarist and sound artist Luigi Archetti here steps out alone for an album of uncompromisingly abstract electroacoustic music. This isn't the sort of easy-going, 'pretty' material you'd get from the current glut of home listening releases, but rather a challenging and rigorous brand of minimalist sound design. The album begins with three tracks totalling fifteen minutes of taut droning sonorities and intricate whirring textures. There's a compelling interplay between apparent stillness and dismantled, detailed timbres that keeps you hooked, right up until the fourth track, on which Archetti projects a deep, gong-like resonance that brings to mind some of Mark Wastell's tam-tam compositions. Similarly, the next piece involves a low, rubbing texture that sounds a bit like some mystery, heavy object spinning on a wooden table-top - this isn't music that ever feels the need to explain itself. 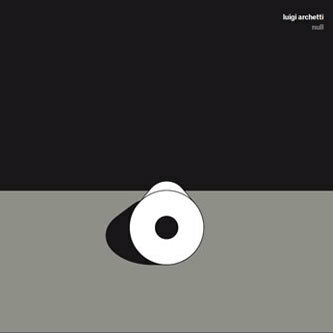 Archetti's work thrives on this level of abstraction, and given how pastoral and atmosphere-fixated contemporary electroacoustic music seems to be getting - what with all the environmental field recordings you hear in ambient records these days - it's refreshing, and arguably more engaging to hear something that's all about sound for sound's sake. As a guitarist making these kinds of detailed, close-up pieces, Keith Rowe's work often springs to mind as a comparison, but in addition to the instrumental recordings (often made from E-bowed guitar), Archetti's sources also include the noise made by generators and the sounds produced from playing back blank video tape. A great collection from Archetti and another very fine Die Schachtel release.